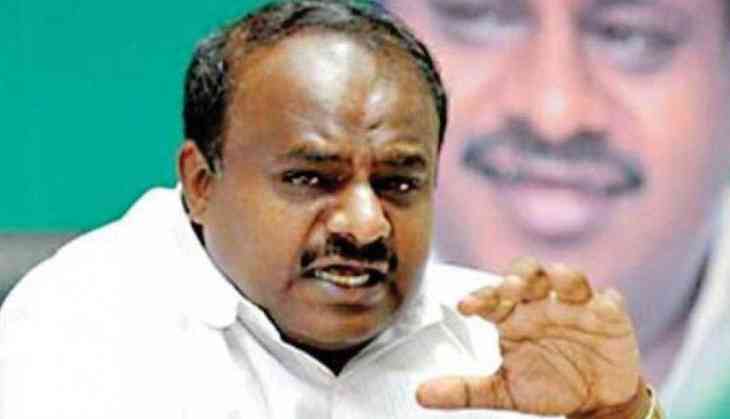 As Bharatiya Janata Party's (BJP) B. S. Yeddyurappa was sworn in as the 23rd Chief Minister of Karnataka on Thursday morning, Janata Dal (Secular) leader, H. D. Kumaraswamy, lashed out at the BJP for misusing the institutions of the Central Government, stating that several Congress MLAs have found themselves in the crosshairs of the Enforcement Directorate (ED). "Modi Government is misusing institutions of Central Government. I know they are threatening MLAs. Anand Singh (Congress MLA) said 'they are using ED, I had a case in ED and they are going to screw me. I'm sorry I have to protect my interest.' Another Congress MLA also mentioned the same," said Kumaraswamy. Stating that he will request for his father, H. D. Deve Gowda's intervention in the matter for rallying all regional parties to make a stand against the BJP, he said, "I will request my father to take the lead and talk to all regional parties and see how BJP is destroying democratic systems, we have to come together to protect interests of the country." Alleging that the BJP are conspiring to 'purchase' their MLAs, he said, "Our plan is to safeguard our MLAs. The BJP and their ministers are working to purchase MLAs, people should know about the attitude of Central Government. BJP does not have a majority, how has the Governor behaved? He has misused his office." On a similar note, Congress MLA Abdul Khader expressed his confidence about all MLAs of the Congress-JD(S) alliance remaining intact, saying, "All MLAs are in contact, the two MLAs who are not present here right now will come, I also just came back from Mangaluru." Earlier this morning, Congress and JD-S MLAs had left from the Eagleton Resort to stage protests at the Mahatma Gandhi statue in the Vidhan Soudha, with several prominent personalities including the likes of G. N. Azad, Ashok Gehlot, Siddaramaiah, Mallikarjun Kharge, K. C. Venugopal present. The Supreme Court had earlier, decided not to put a stay on the swearing-in while conducting a post-midnight hearing, wherein the Congress and the JD-S pleaded for the same, citing BJP's inadequate strength in the assembly to stake claim at forming the state government. The three-judge bench of Justice A.K. Sikri, Justice Ashok Bhushan and Justice SA Bobde, however, did not dismiss the petition filed by the two parties and said: "This petition is a subject of hearing later on".